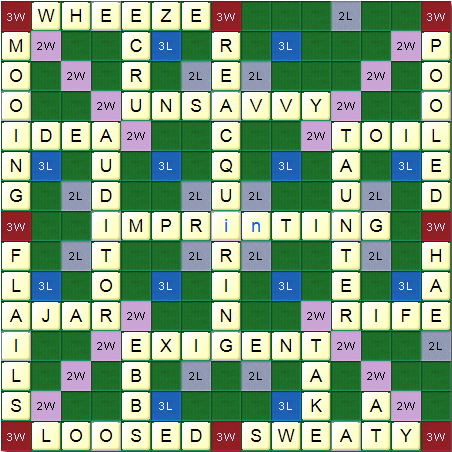 It's generally easier to get a low score in Scrabble than a high one. But is it easier to get a really low score? Suppose you play a game of Scrabble by yourself in which you only make legal plays (that is, they'd withstand a challenge). You eventually play all of the tiles. The order of play is important - if you make two words, you count them both. 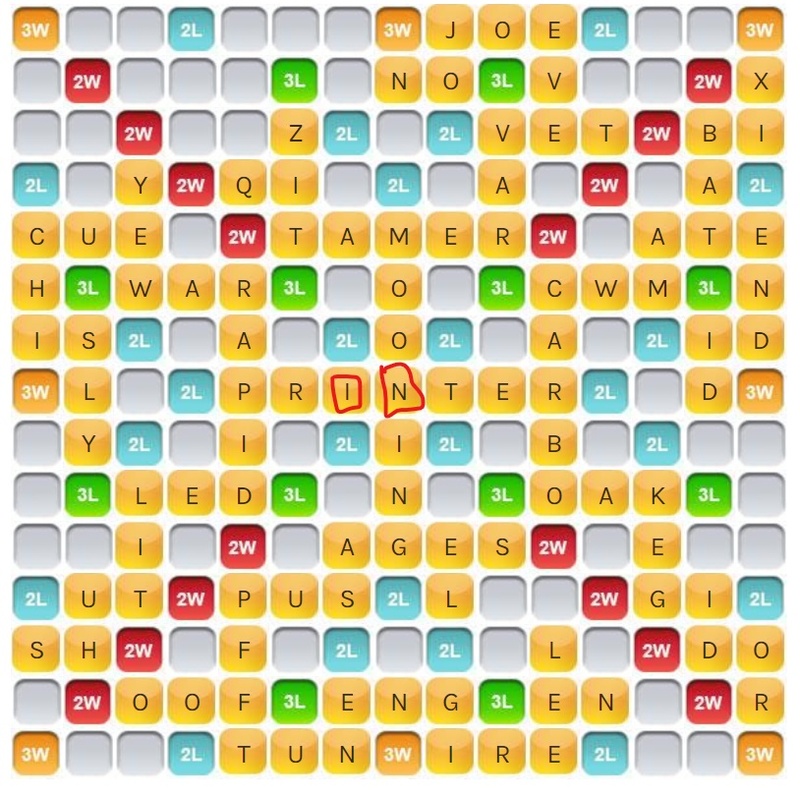 If you play on a double word score, the word that you formed is doubled (so you might want to start by playing a short word). Also remember that if you play all 7 tiles in your hand you get 50 points, so don't do that. A lower bound on the score is 187. This is obviously not possible, as you're going to have to overlap words a fair bit. What is the lowest possible score you can get? I started with the solution given in a paper found by DqwertyC in a comment. Unfortunately, it contains several errors, including invalid words, incorrect scoring, and the wrong tile distribution. Finding ways to resolve these errors gave me the following board. The opening play is es, using both blanks. The next 3 plays of voicers, epigram, and thirties overlap only in blanks. Each of the subsequent $19$ plays forms one of the remaining $19$ visible words, overlapping in exactly one 1-point tile. The bonus squares used are $10$ 1-point tiles on double letter squares (at G3, I3, A4, I7, M7, D8, M9, A12, H12, and D15). Every play uses at most 6 tiles, so no bingos occur. This incurs a total penalty of $19+10=29$ on the total tile score of $187$, resulting in a final score of $187+29=216$. I've managed a score of $225$. I'm sure a better score is possible, since there were a few places where I was not optimal. 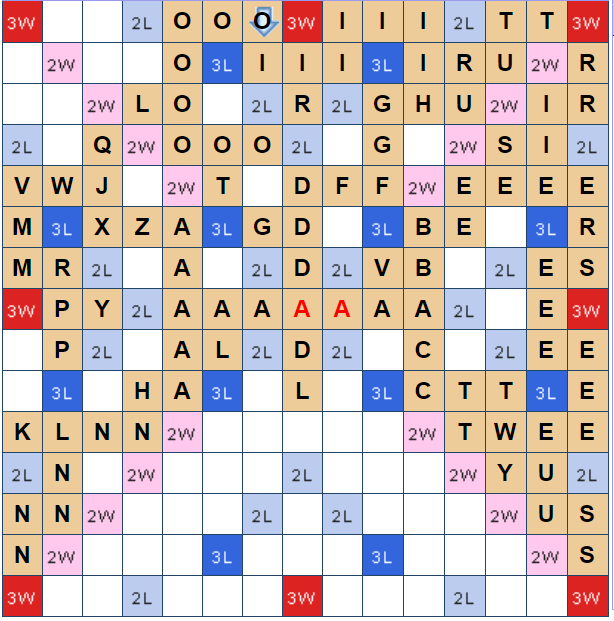 It's impossible to avoid all the "special" squares on the board, so I chose only to hit a few of the Double Letter squares, which are no more penalizing than creating an extra join between words (i.e. it's probably more beneficial to cross a few Double Word squares and get a lot of longer words than it is to squeeze my way in between the "special" square using 3-letter words). I started out using both blanks to negate the automatic Double Word that occurs on the starting square. 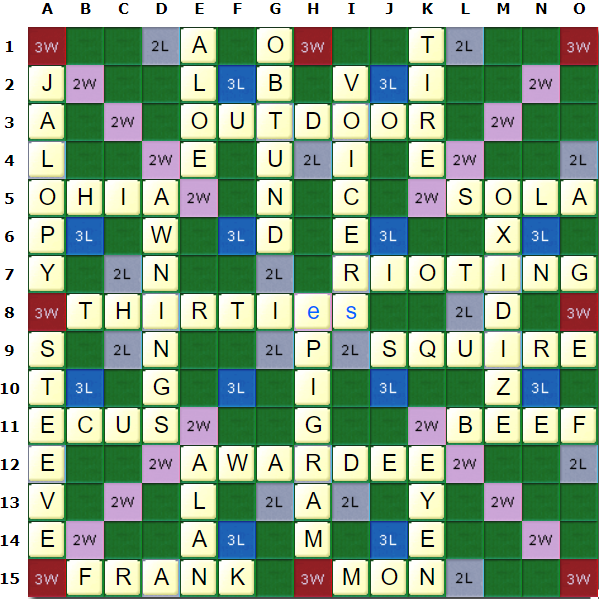 It is in fact possible to do an entire Scrabble game without ever using bonus tile besides the mandatory one in the front. The circled/boxed i and n in the middle are blanks, btw. Here's an interesting note to point out: just because this set-up doesn't use any bonuses doesn't actually make it the lowest scoring game. I screwed up with using the k twice (in OAK and KEG). Even disaccounting for that, there are over thirty different reuses from just my initial count. I actually lost count... If anyone wants to waste their life, feel free to count it up, but regardless, it takes some obscure words and many different tile placement that ends up creating more points rather than just taking the double letter on the 1 point-er. That one's just a joke boad that I made, by techinical rules of Scrabble, if no one challnges it, it's valid. Another way to make a board, without any use of the bonues tiles. Final Point It's physically impossible to achieve 187, as the OP stated. In fact, it's impossible to get 188, 189, etc... you have to cross tiles. I think the only way to get the lowest possible score isn't to use the least number of bonus tiles. Rather, it's the least number of crossings: and those crossings need to be on a 1 tile for minimal effect on the points.